817-19 St. S.E. 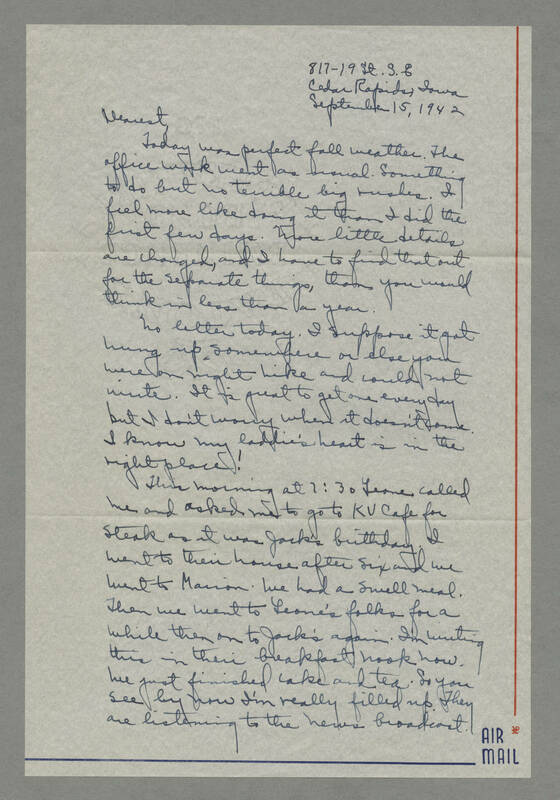 Cedar Rapids, Iowa September 15, 1942 Dearest, Today was perfect fall weather. The office work went as usual. Something to do but no terrible big rushes. I feel more like doing it than I did the first few days. More little details are changed, and I have to find that out for the separate things, than you would think in less than a year. No letter today. I suppose it got hung up somewhere or else you were on night hike and could not write. It is great to get one every day but I don't worry when it doesn't come. I know my laddie's heart is in the right place! This morning at 7:30 Leone called me and asked me to go to KU Cafe for steak as it was Jack's birthday. I went to their house after six and we went to Marion. We had a small meal. Then we went to Leone's folks for a while then on to Jack's again. I'm writing this in their breakfast nook now. We just finished cake and tea. So you see by now I'm really filled up. They are listening to the news broadcast.